Dempsey Essick is a self taught, self expressed realist watercolor artist. He is known as the Hummingbird Bird Artist; not only for the hummingbirds he paints but for the hidden hummingbirds he hides in his paintings. In addition to being an avid bird watcher, Dempsey Essick is just as enthusiastic about fishing. He combines the best of both worlds when he is down on the seashore surf fishing. After he casts his weighted hook out over the breakers and settles down to await a strike he watches the pelicans skimming the wave tops and the busy sandpipers as they chase the receding waves looking for the telltale air bubble that marks the location of a tender mollusk. It is fascinating to watch as the small brown birds run in front of an incoming wave then stop and chase the same wave as it returns to the sea. There will be dozens of them, unafraid of the fisherman or the thundering waves, constantly running, stopping only to probe the sand with their long beaks. 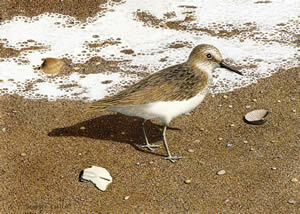 It was during one of Dempsey's surf fishing trips that he decided to paint his little fishing buddy who was racing to and fro in the sand He did a careful study of the sandpiper and the sand and then proceeded to created a painting so real that the viewer has to look hard to be sure that there is not real sand scattered on the image. As is his custom, Dempsey has included the rebus type image of a hummingbird in the painting.